As the most developed city in Central America, Panama City can come as a bit of a surprise. Its modern skyline has no parallel among its neighbours and feels like a complete anomaly in a region far more famous for beaches and jungles than cosmopolitanism. Despite its outwardly contemporary appearance, the capital of Panama hides more than its fair share of iconic historic sites that tell harrowing stories of its, sometimes tumultuous, past. And with even just one day in Panama City you won’t need to stretch the imagination much to create some epic stories of your own. Unsure of how to launch your first 24 hours in the capital? Plan your trip with this complete 1-day Panama City itinerary for independent travellers. In spite of sprawling over the coastline, Panama City isn’t as large as it may first seem—especially for travellers launching their first Panama travel plan from here. 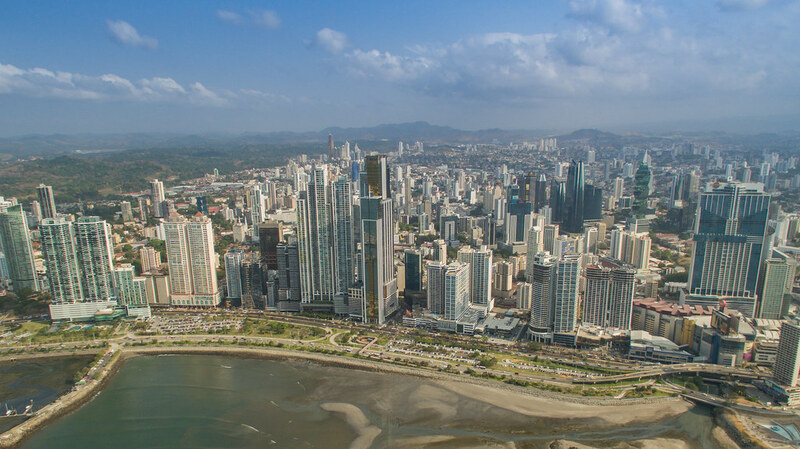 Most of the top points of interest in Panama City are located within a relatively small radius, allowing you to scoot between them without much fuss. To maximize your first 24 hours in Panama City, I’d recommend travelling by taxi. The public transportation system in Panama City, unsurprisingly, isn’t up the same standards as in big European or Asian cities. It’s generally quite crowded and less convenient than using taxis to get around. Like most of the travel itineraries here, this Panama City itinerary attempts to hit as many of the main attractions as possible. Take it all in stride. If you feel you’re moving around a little too much, adjust as needed to tailor the experience to your own personal travel preferences. Preparing for your Panama City itinerary? Don’t forget to protect yourself with travel insurance! The perfect place to start your Panama City itinerary is Panama Viejo (also called Panama La Vieja). This site holds a lot of history, as it is where Panama City was originally founded, and is now a UNESCO World Heritage Site. Panama Viejo is home to what remains of the first European settlement on the Pacific Ocean. This city bloomed in the early-17th century, thriving with homes, trading posts, and places of worship dotting the landscape. It was, however, attacked on January 28, 1671 by a group led by a man known as Captain Morgan. (And, yes, this is the same dude who’s got a best-selling rum bearing his name!) Panama Viejo was lit on fire with many buildings burning down and a lot of people losing their lives. Today, the remains of Panama Viejo are a popular tourist attraction with the ruins telling great stories of what might have been. This site is well structured and labeled with large placards, placed strategically to show you where to walk through. The highlight of Panama Viejo is the Catedral de Nuestra Señora de la Asunción, a building that still stands mostly intact. There’s also a museum here with relics and important artifacts of the city on display. It’s best to make Panama Viejo the first stop on your itinerary in the morning as there’s little shelter here when the midday sun kicks in. About a thirty-minute ride from Panama Viejo is Casco Viejo, the historic old town where the survivors of Captain Morgan’s attack first settled down. 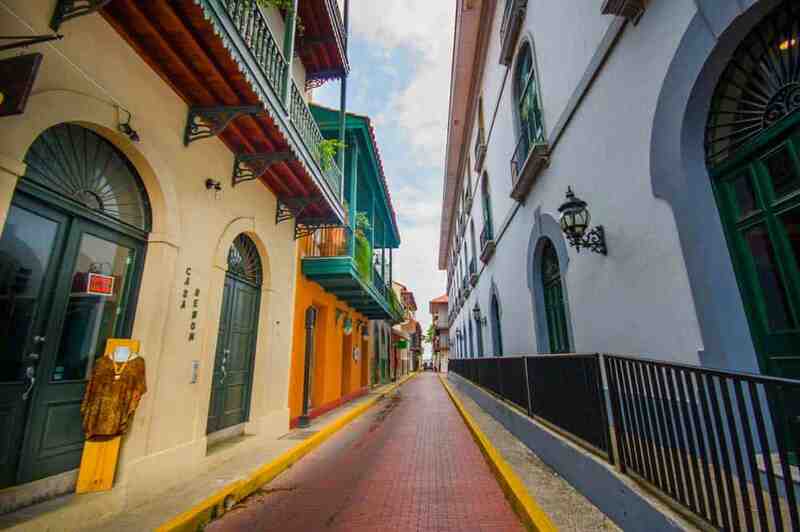 Casco Viejo today is recognized as Panama City’s cultural and historical capital. Like Panama Viejo, Casco Viejo is also a UNESCO World Heritage Site. There’s plenty to see in this part of town while you take a leisurely stroll around. Casco Viejo is, by far, the most photogenic part of the city, full of colonial homes and stately buildings with pastel facades, and flowers dripping off wrought-iron balconies. You can walk around the cobblestone streets, and tuck into bars, hip boutiques, and hotels in Casco Viejo. 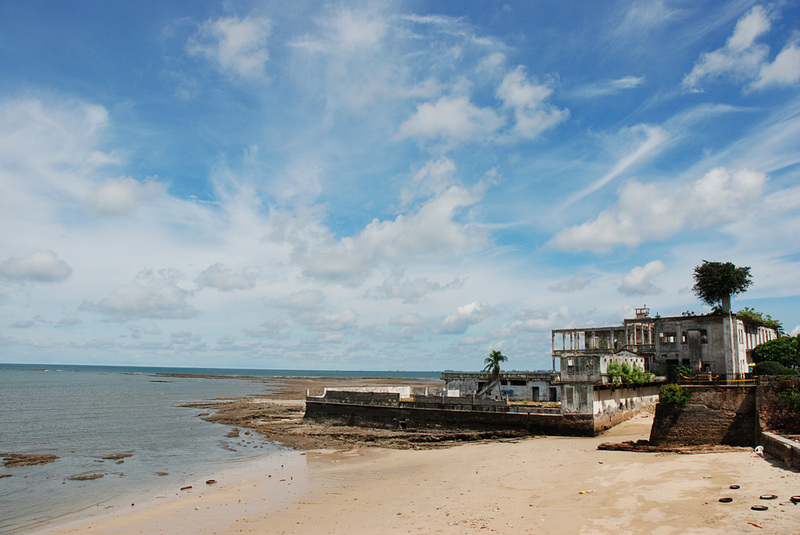 This part of town also boasts excellent ocean views with Las Bobedas amongst the best spots to enjoy them from. You can also pick up tour souvenirs from local artisans while you are at it. There’s also an abundance of restaurants and coffee shops in Casco Viejo. Stop for breakfast at any of the city’s coffeehouses. Dodó and Bajareque Coffee House are great choices. Round out your visit to Casco Viejo by visiting one of Panama’s most impressive buildings, the Metropolitan Cathedral. Leaving the concrete jungle and early settlements behind, you’ll immerse yourself in lush vegetation all the way to the Miraflores Locks on the Panama Canal. This world-famous canal is the man-made wonder that put Panama City in the map. It’s easiest to view the Panama Canal at the Miraflores Locks, about 20 minutes away by car (barring heavy traffic) from Casco Viejo. 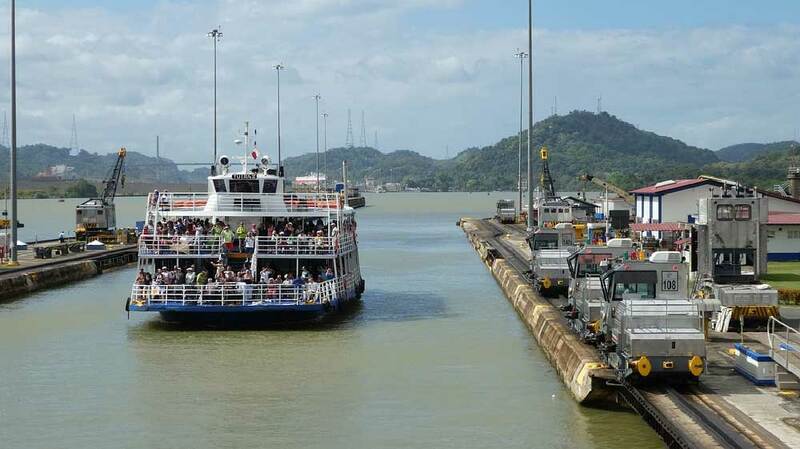 Although it might not seem it at first glance, visiting the Panama Canal is a thoroughly enjoyable experience. The canal is an engineering marvel and, with the tropical scenery around it, makes for the perfect escape from the urban life during your 1-day Panama City itinerary. For an entry fee of $15 you’ll get access to the museum, multiple observation decks, and a theatre showing a short video on the canal’s history. Visit around 11am to 2pm to watch the ships putter along as the locks shift wondrously. By this time, you’ll have probably built up quite an appetite. 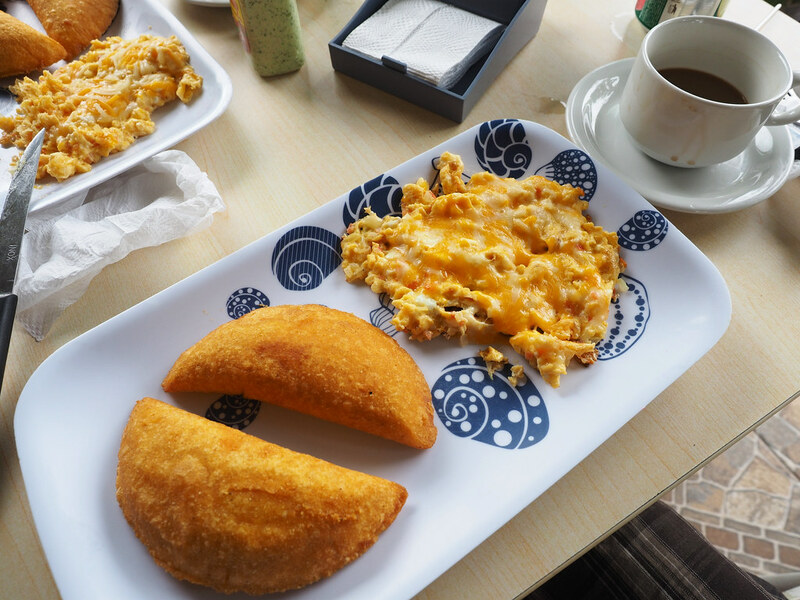 How about grabbing a quick Panamanian lunch to taste all the goodies that Panama has to offer? If you want to eat like a local, head back into the city towards the central neighbourhood of El Cangrejo. It’s a relatively small business & residential area with restaurants, cafés, and small parks. El Cangrejo is home to El Trapiche, one of the most popular restaurants in the city. The most common dish here includes a portion of rice, a soup and a coffee with one of either fried chicken, stewed beef or caramelized pork, all for under $10. What’s more El Trapiche is just a few blocks away from the statue of Albert Einstein’s head sculpted by Carlos Arboleda. You can check out this beautiful work of art and take a few pictures while in the area. Empanadas: Empanadas are a delicious and satisfying snack that’s a must-have in Panama. You can get it at restaurants, coffee shops or normal food stalls. There are several different varieties of empanadas to choose from. Some are baked with doughy shells, lightly-fried with flaky shells or deep fried with greasy shells. The most popular traditional stuffings include beef and chicken. You’ll certainly enjoy this tasty little devil! Patacones: Also known as tostones, patacones are twice-fried plantains, layered with meat and other toppings. Patacones are often served as a side dish. They’re especially delicious when served sizzling from the fryer. With the sun beating down on the city, there’s hardly a better way to escape the heat than by adding some glorious air-conditioned shopping into your Panama City itinerary. It’s just 20 minutes by taxi from El Cangrejo. One of the best places to shop in Panama City is ultramodern district of Punta Pacifica where you’ll find the Multiplaza Mall. This mall features some of the world’s top brands from Cartier to Zara to Hugo Boss. Just around the corner from Multiplaza Mall is Super Mini Diablo Rosso. This is a concept store as well as an art gallery. On offer here is a handful of interesting artwork, homeware items as well as unique fashion items. Be sure to bring along cash to purchase some interesting souvenirs from your trip! After your shopping spree, it’s time to unwind. And there’s no better place in Panama City to do it than the Amador Islands, just 25 minutes by car from Punta Pacifica. The Amador Causeway is by far the most relaxing spot in the city. It offers breathtaking vistas over the sea and the city’s skyline. Gear up for the trip by renting a bike to cycle around or just sit with a cup of ice-cream and enjoy the view. 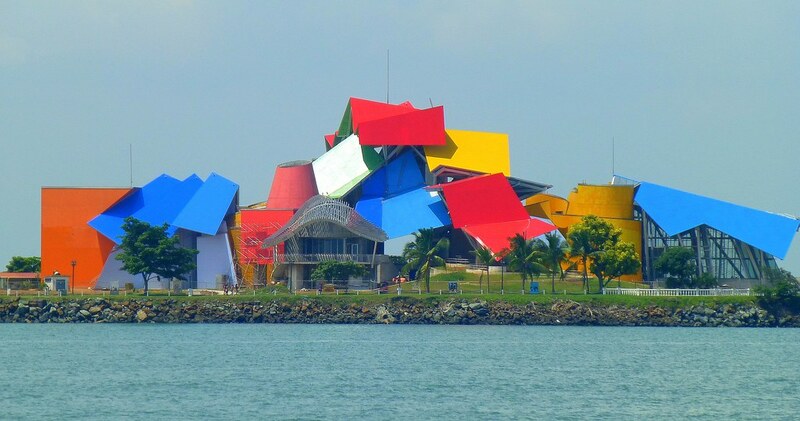 Located in Amador is the most renowned museum in Panama City: the Biomuseo. The museum was designed by the famous Canadian-American architect, Frank Gehry whose work turns heads all around the world. The Biomuseo is made up of eight galleries that focus on the origins of Panamanian isthmus and the impact it’s had on the planet’s biodiversity. When you’re done in the museum, take a walk outside in the Garden of Biodiversity to enjoy the peace and the sound of the birds singing. Biomuseo’s relaxing effect makes it perfect as your penultimate stop on your 1-day Panama City itinerary. After exploring Panama City in one day creating new impressions, spending a happy hour back in Casco Viejo is the best way to chillax. The nightlife in Casco Viejo is always lively and bubbling. There’s a multitude of bars here to try local beers as well as high-quality Panamanian rum. Casco Viejo is also a wonderful place to enjoy local and international foods like traditional Spanish tapas or even Japanese. Watching the whole spectacle of Casco Viejo coming alive from a rooftop is the perfect way to end your Panama City itinerary. One quick word of warning: Be sure to stay aware of your surroundings in Casco Viejo at night. Although this historic area has cleaned up its act immensely in recent years, some of the neighbouring districts likeEl Chorrillo, Santa Ana, and San Miguel are still notorious for their safety concerns. Like most Central American cities, choosing where to stay in Panama City can present a bit of a challenge. Although safer than most other urban centres in the region, Panama City’s still got its share of seedy areas that you’d do well to stay away from. Eurostars Panama City: A contemporary stylish hotel that’s chock-loaded with great amenities and boasts an ultra-central location. Extras like a Turkish bath, sauna, and 27th-floor outdoor pool out-deliver what you’d expect with its budget-friendly price point. Hyatt Place Panama City Downtown: My own top pick for the area, this mid-range hotel is centrally-located and offers extras like an outdoor pool & breakfast buffet for guests. Try to get a room with skyline views for the ultimate Panama City accommodations experience. Global Hotel Panama: The spacious & contemporary rooms at this 4-star hotel are a hit. What really intrigues most guests here, however, is the outdoor pool where you can cool off in the sweltering Panamanian sun to incredible views over the capital. W Panama: A tremendous 5-star luxury hotel that’s among the best in the city. Like others in the chain, rooms at the W are über-stylish and push the envelope on comfort. Splurge on one of the massive Fabulous King Rooms to see the city at its finest from your own private balcony.